1. Observe the Physiograph and, at the same time, study figures 19.2 and 193 to learn the names of its major parts. 2. 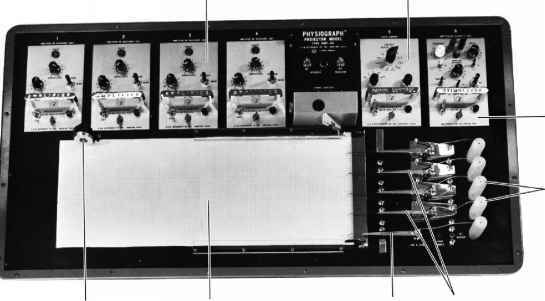 Note that the recording system of the Physiograph includes a transducer, an amplifier, and a recording pen. The transducer is a sensing device that can respond to some kind of physiological change by sending an electrical signal to the amplifier. The amplifier increases the strength of the electrical signal and relays it to an electric motor that moves the recording pen. As the pen moves, a line is drawn on paper. 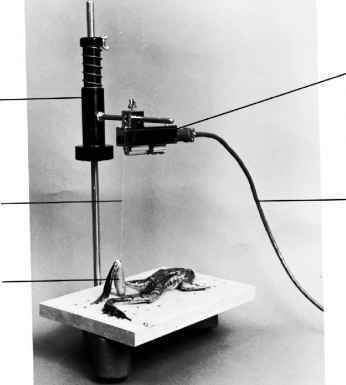 To record a frog muscle contraction, a transducer called a myograph is used (fig. 19 3). The origin of the muscle is held in a fixed position, and its insertion is attached to a small lever in the myograph by a thread. The myograph, in turn, is connected to the amplifier by a transducer cable. The muscle also is connected by wires to the electronic stimulator, which is part of the Physiograph. This stimulator can be adjusted to deliver single or multiple electrical shocks to the muscle, and the intensity (voltage), duration (milliseconds), and frequency (stimuli per second) can be varied. Figure 19-2 Major parts of a Physiograph. Figure 19.3 Myograph attached to frog muscle. The speed at which the paper moves under the recording pen can be controlled. A second pen, driven by a timer, marks time units on the paper and indicates when the stimulator is activated. As the muscle responds to stimuli, the recording pen records the duration and relative length of each muscle contraction. 3. 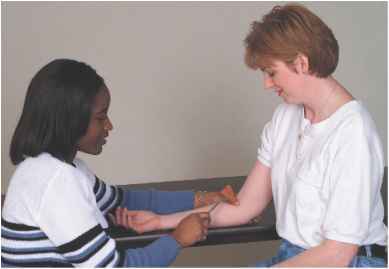 Watch carefully while the laboratory instructor operates the Physiograph to record a frog muscle contraction. How to operate physiograph for muscle contraction?